Line twenty-two to twenty-four 2 1/2-inch muffin cups with paper bake cups; set aside. In a large mixing bowl, combine cake mix, eggs, root beer, oil and the 4 1/2 teaspoons root beer flavoring. Beat with an electric mixer on low speed until combined. Beat on medium to high speed for 2 minutes more (batter will be thick). Divide batter among prepared muffin cups, filling cups two-thirds to three-fourths full with batter. Bake in a 350 degrees oven for 12 to 15 minutes or until a wooden toothpick inserted in centers comes out clean and tops spring back when lightly touched. Cool cupcakes in muffin cups on wire racks for 5 minutes. Remove cupcakes from muffin cups. Cool completely on wire racks. For Root Beer Frosting: Stir the 2 teaspoons root beer flavoring into the frosting until well combined. Just before serving, top each cupcake with a root beer-flavor candy or crush candies and sprinkle over cupcakes. Cut straws in half; discard bottom (straight) halves. Garnish cupcakes with a bent straw half. These are terrific! Mine turned out much darker. The root beer flavoring I used was very dark. Is there any other type of root beer flavoring that is clear? Hello! Food editor Hannah here. I'm glad you liked the cupcakes. Root beer extract is always brown, including the one we used, so I'm not sure if that's what caused your cupcakes to be dark. I checked with our test kitchen, and they mentioned that it could be the pan you used or your oven. If you want to talk further about it, feel free to email us at midwestliving@meredith.com. Thanks! there is also a concentrate of the root beer flavoring. This is what I used and my cupcakes came out dark. The second batch(had to make 30) I added a little less and the color was lighter. These look delicious! I wanted to make them for Superbowl Sunday but I am trying to find the flavoring and can't find it anywhere! I live in Chicago, any ideas? Thank you! Midwest Living here! You should be able to find root beer flavoring (extract) in most grocery stores (same section as vanilla extract, peppermint extract, etc.) but if not, check at a Super Target or Wal-Mart. Hope you're able to find it! We think you'll love the cupcakes. 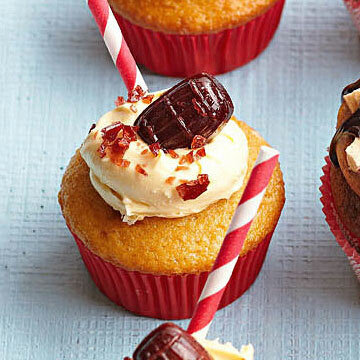 root beer float cupcakes, this is great. a dual purpose with cake and beer. superb. Just made the root beer float cupcakes for my son's birthday at school. I went and got root beer flavored candy sticks instead of using straws. I also tried just a cupcake and it was good can tast the root beer. Think I may try another root beer brand to see if has a different taste. Also I found out if the root beer flavoring sits in the icing over night the flavor is more.